As much as it might be tempting to lament the stranglehold that Steam has on PC gaming, it’s also for a few very good reasons; the community aspects, and the auto-patching are just a few, and when a highly anticipated MMO comes along, everyone who uses Steam is going to add it to their library anyway. Either way, the news that Planetside 2 is definitely coming to Steam, according to SOE President John Smedley, can only be a good thing. The beta is slated to start this evening, although there’s still no absolute confirmation. Instead we have to sit here in desperate anticipation, poring over images of Max Suits and Galaxy transports, just imagining what it might be like to maybe, yes, maybe, plunge out of that dropdoor, hurtle to the ground, the battle beneath you, and lose yourself in a bloodlust of laserfire and heroism. And there’s little doubt in my head that the little pings of Steam messages in the bottom corner of your screen are going to be growing increasingly desperate and alarmed as Planetside 2 gets its grips on the gaming community at large, forcing you to plead with your friends to log on, fire up their vehicles and bring in the reinforcements that your last damn base so desperately needs. Which is in addition to SOE’s plans to have communication from outside the game in the form of apps for both iOS and Android, where you can actually use VOIP to communicate with your faction-mates even while on the move. Probably not a good thing for those of you with a social life. 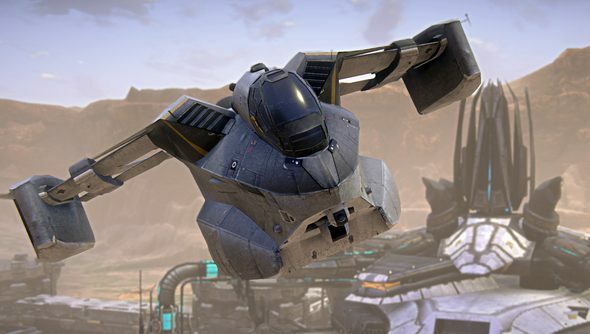 There’s no official release date for Planetside 2 just yet, but with things moving at the pace they are, it’ll hopefully be properly live by the end of the year.